If you’ve seen one elephant, have you seen them all? “A horse is a horse” – but is any elephant just another elephant? 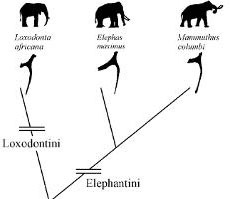 A cladogram showing the relationships between the African elephants (genus Loxodonta), Asian elephants (genus Elephas) and pleistocene woolly mammoths (genus Mammuthus) based on the hyoid bone, which is located in the neck. Figure from Shoshani & Tassy 2004. Few people realize that Asian and African elephants are about as different from one another as we are from chimpanzees. That’s not an exaggeration – the estimated time that they diverged from a common ancestor is about six million years ago , whereas humans and chimpanzees are estimated to have diverged between five to six million years ago . Some have even suggested that Asian elephants may be more closely related to woolly mammoths (Mammuthus primigenius). It’s ok if this surprises you – the elephants may appear to resemble one another more closely in appearance and sound than humans and chimpanzees. But what about their behavior? On both continents, a few things do remain constant – the long gestation period, for instance. Because Mama elephants take a long time between births, bulls roam far and wide in search of mates, trying to catch the brief windows during which females are available. As a result they don’t stay with the social units they were born into, but females can. Now what about the females themselves? After all, Asian and African elephants have been on different continents, experiencing different kinds of environments and predators for quite a while now. Until recently, a lot of what was known about elephant social behavior was derived from studies of African elephants. But last year we showed for the first time that female Asian elephants in fact also have very extensive and dynamic social relationships . We were curious about how social structures might compare across species if we stacked them up side by side. In a study just published in the International Journal of Primatology’s special issue on ‘multi-level’ societies, we made a direct side-by-side comparison of the social attributes of adult female African savannah elephants (Loxodonta africana) and their Asian counterparts (Elephas maximus). The African dataset came from a long-term study in Samburu and Buffalo-Springs National Reserves in Kenya, whereas the Asian dataset, of course, was from Uda Walawe National Park, Sri Lanka. The two studies were very similar to one another in methodology and remarkably similar even in the number of individuals and spatial extent observed, which allowed a pretty decent comparison. Click to enlarge. Pairs of Asian elephants (E. maximus) don’t tend to have as many strong ties to one another as pairs of African savannah elephants (L. africana), though both populations have many more strong ties than expected by chance (the panels marked ‘rand’ for random). We found that indeed there were differences between these two populations *. First, female African elephants tended on the whole to have much stronger ties to one another than the Asian elephants. Although both species had extensive social networks, the African elephants were also a lot more inter-connected. It took only two steps (or ‘two degrees of separation’) to connect any two individuals in the African population, but it took three or more in the Asian. The African population also tended to show more pronounced differences between seasons than the Asian, with bigger groups and stronger associations in wet seasons. Click to enlarge. Each dot is an adult female, with lines showing the strength of their relationship. Thick lines indicate strong relationships, whereas thin lines indicate weaker ones. It is immediately evident that the African population is much more inter-connected. As a result, the degree of stratification also differed between these two societies. 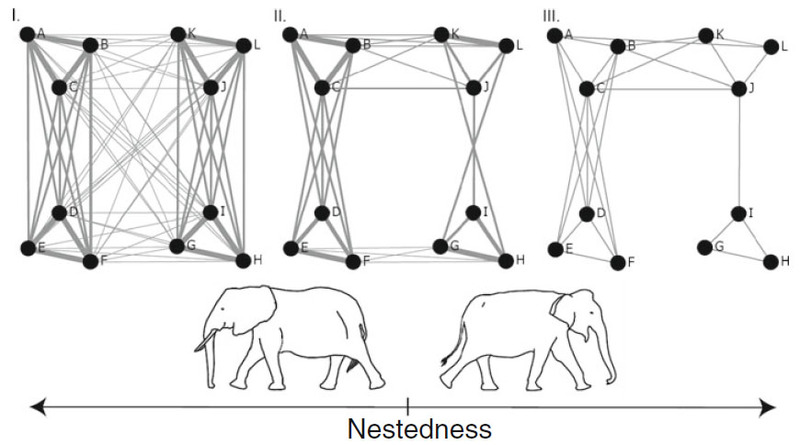 African elephants showed at least two clear points of structural change in their social networks, whereas the Asians consistently showed only one. This makes sense if you remember that the latter have weaker ties to one another to begin with (on average), there’s less wiggle room in which to express variation in the strengths of bonds. 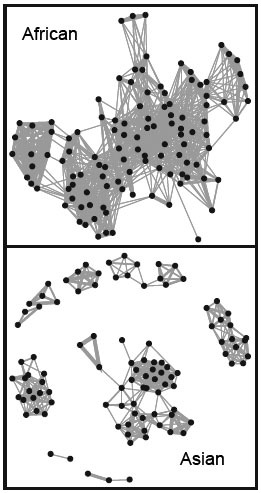 These differences led us to propose that maybe social stratification – that is, the degree to which individuals form hierarchically nested relationships with one another – may not be something that is simply present or absent in a society, but that different societies may express different degrees of stratification. Wait – back up, you say. What do you mean by “hierarchically nested relationships”? Well, imagine that you and your sibling are inseparable. Whatever you do, you do together. You’re embedded in a very closely-knit family, and whenever there’s any social gathering either you all go or none of you do. Essentially you all function as a higher order unit, in which the smaller units (like your parents, you and your sibling) are nested. Now imagine the opposite – a family of very strongly individualistic people, where everyone is busy doing their own thing. You can easily imagine that there can be something in the middle – in which some family members are very close, and others are rebels. Now expand this thinking to animal societies – we mean such differences may exist not just as variation within a species, but also across species. Because this study involved only one population of each species, it’s difficult to say whether the differences we saw were truly differences between the species or differences due to the local environments of each species (which differ substantially across populations). Similar studies from multiple other locations would really help to shed light on what is driving the differences we found. Which is to say: go out and study more elephants! We want to know what you find. *The original paper can be found here.